Eye on the inside: Do cameras in nursing homes protect or intrude? As suddenly as he lost his ability to speak last fall, Stuart Sanderson’s connection to the world outside his Philadelphia nursing-home room was severed because of anxiety over a simple webcam. A compact video camera on his computer monitor allowed him to speak to family even without a voice. 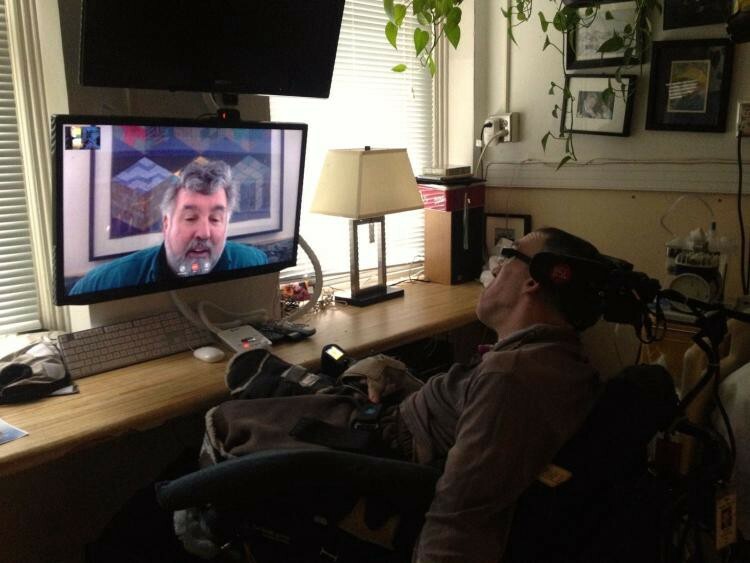 Stu, as he prefers to be called, has cerebral palsy, but video calls put him in touch with his ailing father and his brother, who would take the time to read his lips. But to Inglis House, the nursing home where he has lived for decades, the camera was a watchful eye, scrutinizing its staff’s every move and capturing images of people whose privacy they’re responsible to protect. Stu’s computer equipment was abruptly removed in mid-December, and he was asked to write a note defending his access to it. Family members called it a “cruel hurdle” for a man with limited mobility who selects each letter by pushing the back of his head against a switch. The Sandersons unwittingly became part of a splintered national debate about the role of video cameras in long-term care facilities. The conversation includes webcams used for video calls, clocks with hidden pinhole cameras, and motion-activated cameras that broadcast live video feeds to laptops and smartphones. The cameras can be used to deter or catch abuse and neglect, but they also threaten the privacy of other patients and employees. At a time when police officers wear body cameras and average citizens check video feeds of their children and pets at daycare, the long-term care industry is being forced into a game of catch-up. For nearly a month, Stuart Sanderson felt isolated and upset that he was being cast as a troublemaker. When his brother, Scott, visited on the weekends, Stu — a published poet and college graduate — revealed that he had been asking to be put to bed early. He didn’t want to cause any more problems. Even when Inglis House returned the electronics, tension lingered. 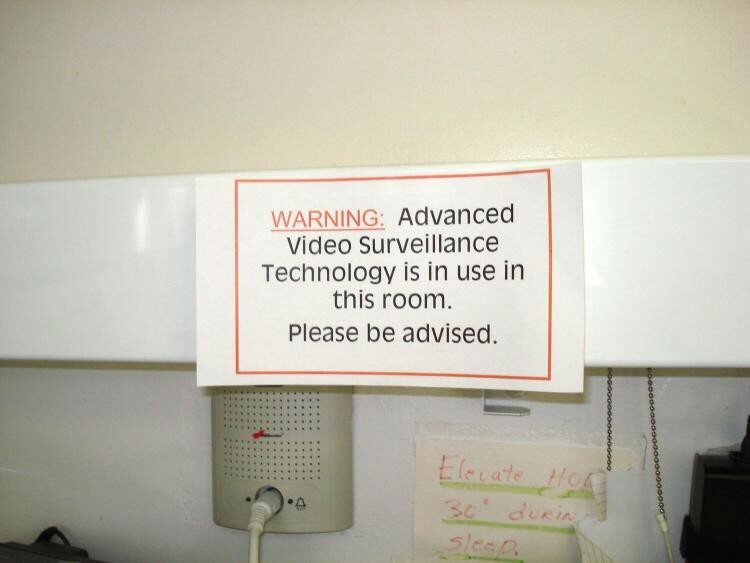 Signs warning of advanced surveillance were plastered on the walls of Stu’s room. Caregivers covered or moved the webcam and forgot to reposition it, Scott Sanderson said. Inglis House made adjustments. They posted just one, friendlier sign and told the staff not to touch the equipment. If the webcam’s orange light was on, Scott said they were advised to ask Stu if he was comfortable receiving care. The facility is now drafting a policy to address cameras for communication needs and those used to monitor care, either visibly or covertly, said Gavin Kerr, president and CEO of Inglis House, a nonprofit nursing home that serves about 300 people with complex disabilities and health care needs. He said the policy will support residents’ rights to cameras as long as they notify staff. Inglis House and other nursing facilities in Pennsylvania are flying blind. Pennsylvania doesn’t have regulations pertaining to cameras in nursing homes. A state wiretapping statute forbids audio recording without the consent of all parties; video is fine, though. Federal guidelines prioritize residents’ rights, but there are conflicting interpretations. So individual facilities are left to figure it out on their own. A handful of states took that decision out of their hands. In 2001, Texas became the first state to expressly allow electronic monitoring in long-term care facilities. New Mexico, Washington and Oklahoma followed suit. Maryland gave its nursing facilities guidance on how to properly allow cameras, but left it up to them if they will permit it. Legislative bodies in two more states, Illinois and Missouri, are considering proposals. No state has passed a law banning cameras in nursing facilities. The laws generally require that administrators are notified of the camera and that consent forms are signed by the resident and any roommates. Signs notifying staff, residents and visitors of the cameras are required at the resident’s door or the facility’s entrance. Illinois Attorney General Lisa Madigan, in her proposed legislation, calls for the recordings to be admissible in court, and creates penalties for tampering with cameras or recordings. Hidden cameras have caught abuse at Pennsylvania long-term care facilities. In three notable cases out of Bucks and Delaware counties between 2011 and 2014, families had suspicions and set up cameras. The recordings captured mocking, manhandling and slapping. Collectively, six caregivers were arrested, one nursing home was closed and another operated on a provisional license until it made state-mandated corrections. Attorneys general in New York and Ohio have used hidden cameras in similar cases. The Pennsylvania Attorney General’s Office has not used hidden cameras to investigate long-term care facilities, “but that doesn’t mean we wouldn’t,” said spokeswoman Carolyn Myers. The Pennsylvania Health Care Association, with nearly 450 long-term care providers as members, has not made any rules on the use of video cameras, said CEO Dr. Stuart Shapiro. The use of cameras has always been a gut-wrenching notion to elder advocate Diane Menio. Someone’s privacy and dignity will be eroded by the footage. On the other hand, the monitoring could save a life or act as a deterrent. Menio, executive director of the Philadelphia-based Center for Advocacy for the Rights and Interests of the Elderly, spoke of a friend whose mother says her caregivers are abusive. The staff shrugs it off and reminds the friend her mother has dementia. The cameras are easy to come by with a basic online search: A hidden-camera alarm clock equipped with night vision and motion-activated recording starts at $99. A $400 air purifier has a tiny camera that can store recordings for up to a month. The hidden variety also come in coat hooks, picture frames and tissue boxes. Some people opt for visible security cameras to let the staff know they’re watching. Covert or not, consent by the resident is of the utmost importance, and that’s a slippery concept with people who have dementia or other illnesses that might make them incapable of that decision, Menio said. Too many family members decide to use video cameras because they feel the duty to protect a frail loved one, said Nina Kohn, a Syracuse University law professor who specializes in elder law and the civil rights of senior citizens. Several elder advocacy organizations support the use of video technology when the resident wants it and privacy safeguards are in place. “You’re dealing with a vulnerable population and if a resident wants that to feel more comfortable, we certainly think they have right to have that type of monitoring,” said Amity Overall-Laib, a manager at The National Consumer Voice for Quality Long-Term Care. AARP has a national policy supporting the use of cameras for communication and surveillance, said Ray Landis, advocacy manager for AARP Pennsylvania. But without set standards in most states for how video cameras are used in nursing homes, how secure is it? Many nursing facilities may not have the technical expertise to spot potential breaches in security, said Majd Alwan, senior vice president of technology at LeadingAge, a national association of 6,000 not-for-profit providers of aging services. And there are concerns about what’s being done with images now that it’s so simple to share content online. Both facilities and families can do more, before suspicions rise to the point of surveillance. Alwan suggested families create relationships with administrators and caregivers and join the family council. More and more nursing facilities and retirement communities, he said, are using video conferencing for caregivers to meet with family and are also offering personalized calendars and email updates to show what residents do all day. “I believe that can go a long, long way, much better than the broad blanket use of cameras,” Alwan said. No matter what they do to quell concerns, the technology isn’t going away. Gavin Kerr of Inglis House said he would encourage other nursing homes to start planning now. Talk to residents, families and employees; exchange ideas with friends at other facilities; and look for opportunities to better residents’ lives with technology, he said. Reach Halle Stockton at 412–315–0263 or hstockton@publicsource.org. Follow her on Twitter @HalleStockton. 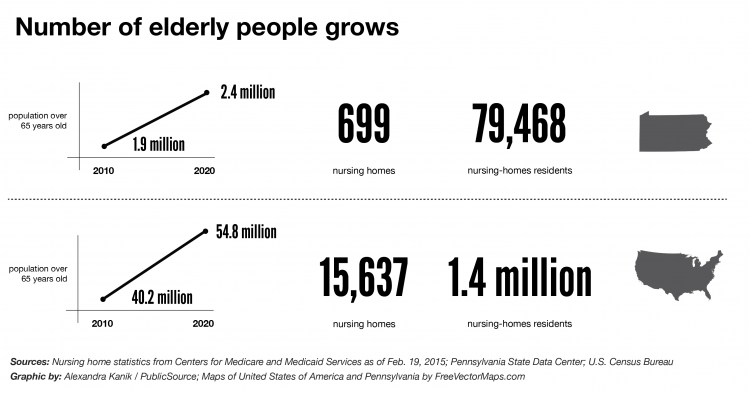 Reporter for @PublicSourcePA on issues of #aging and #disability. Also, lover of Star Trek and schnauzers. PSU alum. RTs≠endorsement.